Need some holiday swirls to complete your Christmas scrapbook or cards? 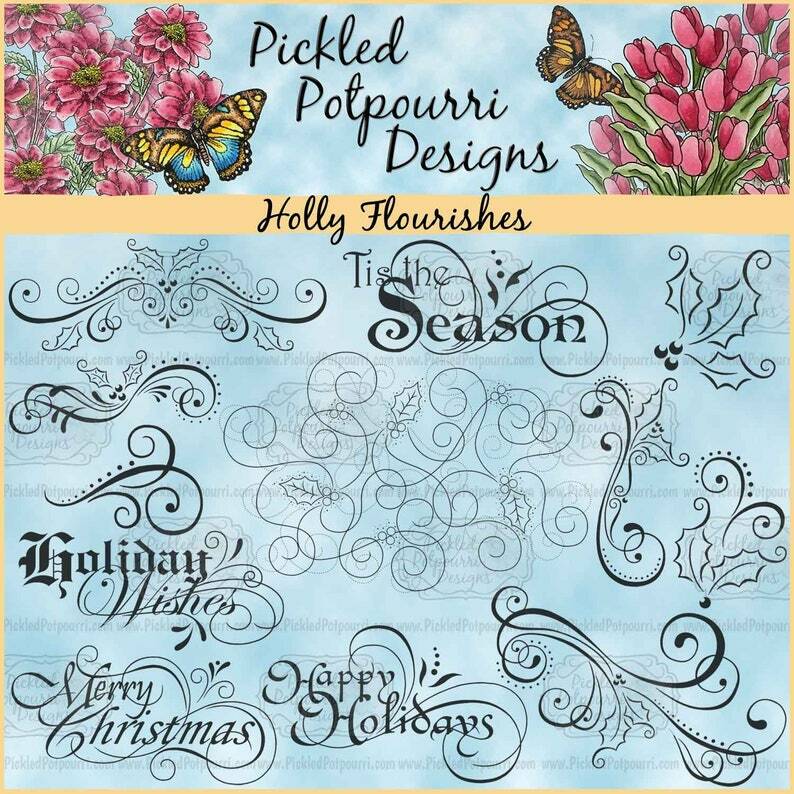 Our Holly Flourishes Digital Stamp set is a lovely complement to your holiday project or for any time of the year! The large Holly Swirl image (in the middle of the listing photo) is approximately seven inches wide. 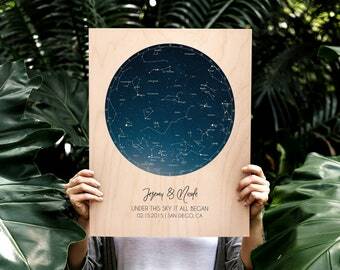 The listing photo shows the size of the other images and the sentiments in relation to the Holly Swirl image at full size. 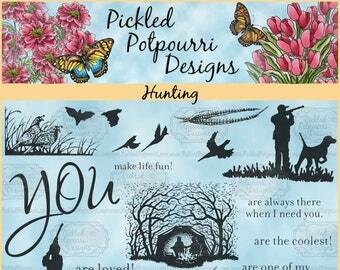 All Pickled Potpourri digital design files are high-quality 300ppi PNG files for sharply printed images. PNG files are transparent (backless) so that you may layer images and/or sentiments to achieve the effect you want before printing. Unless otherwise specified, PNG files are in black & white only (grayscale, no color) in order to provide you with the highest quality when printing. PNG files can be easily reduced in size to meet your needs. If you increase the image size you may lose some print quality. However, each Pickled Potpourri design should be large enough to meet most - if not all - papercrafting needs. => No watermarks on your purchased files. => Fonts are not included. => Colors may vary on different computer screens and printers. Such sweet images --- I had a lot of fun creating a card with the kitten one! Pickled Potpourri accepts PayPal, all major credit cards, Apple Pay, Google Pay and Etsy gift cards. You are responsible for any applicable sales and/or use taxes, VAT or other duties/fees on your purchases from Pickled Potpourri Designs. Pickled Potpourri is not responsible for any taxes/duties/fees owed on your purchase of our products. 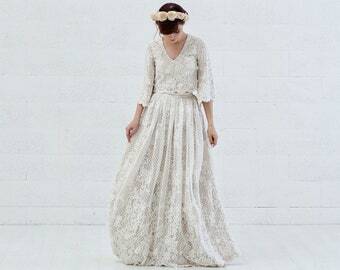 Etsy automatically includes any applicable VAT in the final order price on digital items. Pickled Potpourri is not responsible for any VAT collections, payments or remittances. Buyers in the state of Alabama (U.S.) will be charged state sales tax. No personal checks / money orders accepted. Due to the nature of digital downloads, no cancellations/refunds/returns/exchanges will be given on any purchase. If you receive a damaged file from Pickled Potpourri Designs, convo me within three (3) days of your purchase and I will work with you to get you a good file. 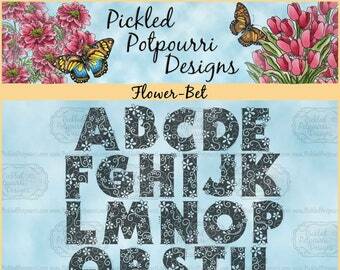 You are purchasing/receiving the right (in the form of a limited Personal Use License) to use Pickled Potpourri Designs digital paper, images, designs/sentiments and/or other printables for your personal crafting use. You are NOT buying the illustration/design itself and have no other rights in association with Pickled Potpourri Designs paper and images. 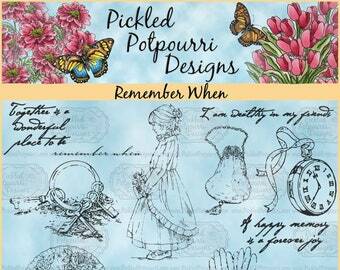 Purchasing does not transfer ownership of any designs by Pickled Potpourri. > Make art! 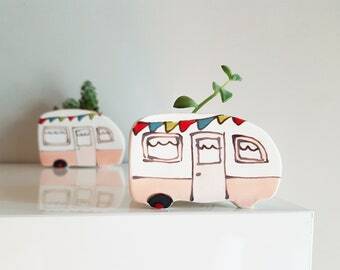 You can create handmade papercraft projects (including but not limited to cards, ATCs, scrapbook layouts, mixed media projects, etc.) 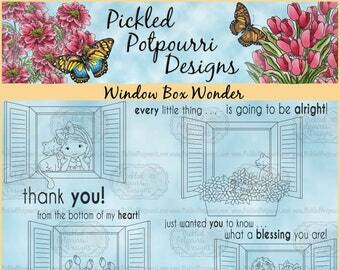 with Pickled Potpourri Designs digital paper, images, designs/sentiments and/or other printables and we encourage you to do so! That is why we make them. > The projects are not mass produced, assembly-line constructed, produced by workers for hire, or syndicated in any way. > You can upload your projects that include Pickled Potpourri Designs paper and images to your blog and other internet venues. Pickled Potpourri Designs encourages you to watermark your projects before uploading to any internet venue in order to help protect your work. 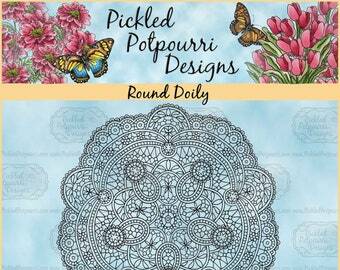 > You may not sell or distribute Pickled Potpourri Designs digital paper, images, designs/sentiments and/or other printables, plain or colored, in either physical or digital form if they are not part of your handmade project. 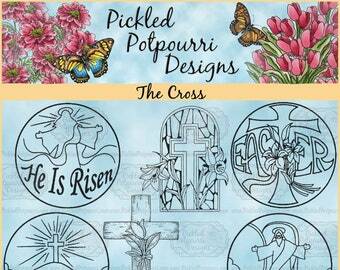 Only Pickled Potpourri Designs has the legal right to sell and/or distribute our designs. > This includes paper and image/sentiment swaps or digi/digital paper and image/sentiment electronic swaps, sold/distributed as part of any kit (digital or tangible), printed out paper and images/sentiments, scanned paper and images/sentiments, CD paper and images/sentiments, stock paper and images/sentiments, clip art images/sentiments and prizes/give-aways. 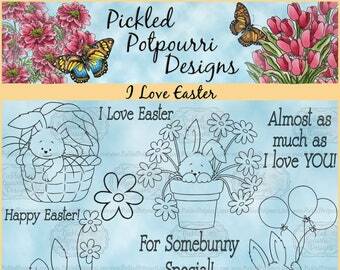 Black and white and/or colored line art and sentiments from Pickled Potpourri Designs may not be sold or distributed in any manner - whether digital or printed. 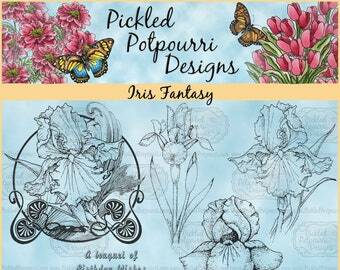 In other words, the Pickled Potpourri Designs digital paper, images, designs/sentiments and/or other printables you've purchased/received are for YOUR use. You do not have permission or the legal right to give (i.e., distribute) them to anyone (sub-licensed, resold, shared, transferred, or otherwise redistributed on its own - even for free). No commercial use is allowed. You may not claim any of our designs as your own. 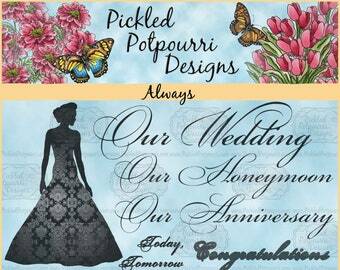 > You may not reproduce Pickled Potpourri Designs digital paper, images, designs/sentiments and/or other printables in any form or manner, including derivatives. Neither may you do this and claim it as your own. No altering of the paper and images is allowed. 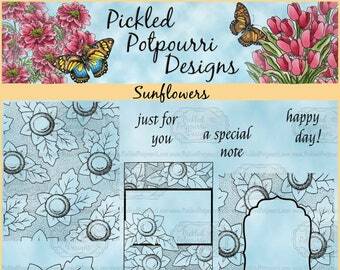 > You may not use Pickled Potpourri Designs digital paper, images, designs/sentiments and/or other printables for any type of MASS PRODUCTION. 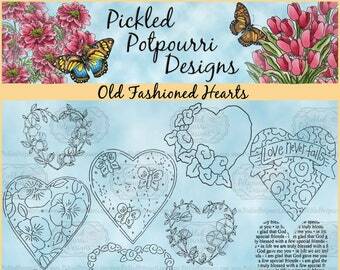 > You may not use Pickled Potpourri Designs digital paper, images, designs/sentiments and/or other printables for the purpose of creating logos, trademarks, service marks, promotional materials, business cards or on websites (including blogs, banners, etc.). 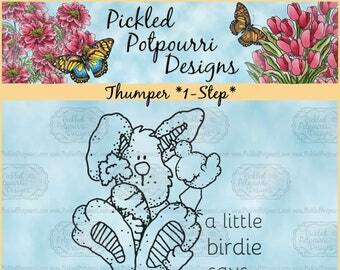 > You may not use Pickled Potpourri Designs digital paper, images, designs/sentiments and/or other printables for making molds to reproduce the design, nor to create patterns for anything, including rubber or acrylic stamps, embroidery, cross-stitch, stitching, jewelry, wood products, metal, tattoos, etc. and sell or distribute them in any way. 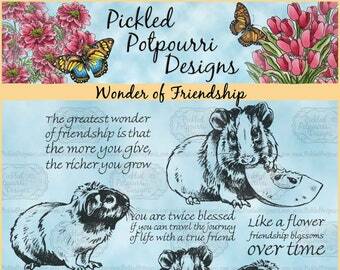 This not only violates the legal copyrights of Red Rubber Designs LLC (DBA Pickled Potpourri Designs), but of its artists as well. > You may not store, post or PIN our un-watermarked digital paper, images, designs/sentiments and/or other printables on Pinterest or any other internet venue (including but not limited to blogs, forums, internet communities, etc). This includes private blogs, private Pinterest boards, private forums and/or galleries, etc. Cards and other projects that you've created using Pickled Potpourri Designs digital paper, images, designs/sentiments and/or other printables are okay and encouraged to share on your blogs and in crafting galleries. 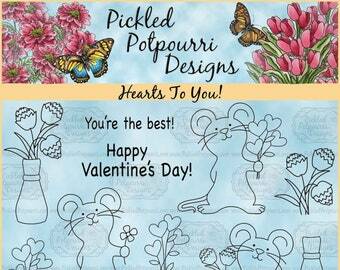 > You may not use Pickled Potpourri Designs digital paper, images, designs/sentiments and/or other printables for any print on demand services like CafePress, Zazzle, etc. or to create promotional printed materials (T-Shirt, cups, bags, etc). Please do not redistribute (emailing, sharing, copying, duplicating, reselling, etc.) 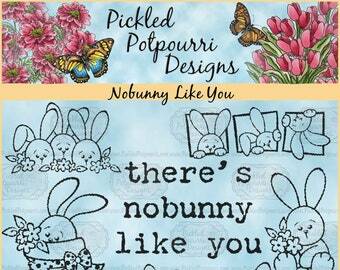 any of our digital paper, images, designs/sentiments and/or other printables. 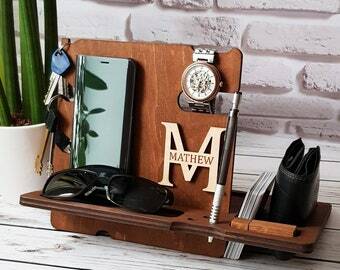 We always appreciate referrals to our Etsy store so that your friends and family can purchase their own copy. 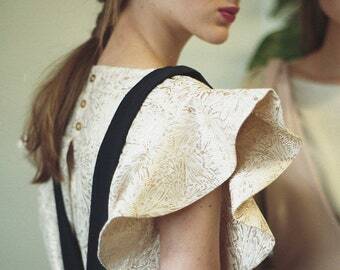 We are a small, woman-owned business and this is how we make our living. When people share our images, that is potential income that we lose. (Plus, it's illegal.) We appreciate your support! Red Rubber Designs (DBA Pickled Potpourri Designs) retains all rights associated with its paper, images, designs/sentiments and/or other printables. This agreement shall be governed and construed in accordance with the laws of the state of Alabama. Any and all legal disputes arising from the violation of these terms shall be brought only in Madison County, Alabama.